Pinot Noir is the great grape of Burgundy. It requires a rich soil, but climate is the key factor in growing Pinot Noir. The grapes love cool climate areas. This is why you find Pinot Noir here in California and Oregon. In California, it is grown in these cool climate areas that have many foggy mornings and very cool evenings: Carneros, Anderson Valley, Russian River Valley, Santa Cruz, Sonoma Coast, Monterey, and Santa Barbara. In Oregon, Pinot Noir is the grape of the great Willamette Valley. In Burgundy, there are four classifications of this great grape. At the top are Grand Cru wines that can cost more than $2000 per bottle in the great years. New Zealand is the latest country to make a strong effort in producing Pinot Noir wines. Pinot Noir is difficult to grow and the yields are typically small. 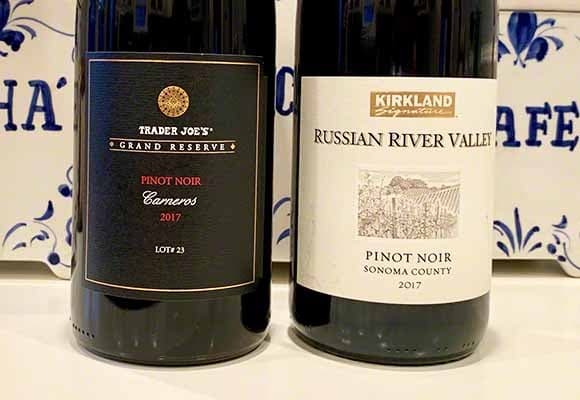 For bargain wine hunters, a good Pinot Noir is one of the most challenging wines to find under the $20 category. The cult movie “Sideways” is the single most important reason why Pinot Noir production and sales soared following the movie’s release in 2004. More on the movie Sideways. The color of Pinot is generally lighter than most red wines. Pinot Noir is a light-to-medium bodied wine. In recent years some producers in California have been making big and bold Pinot Noir wines much heavier in style. A true Pinot Noir lover will shun those wines. Pinot Noir has red fruit aromas and flavors of raspberry, strawberry, cherry, sometimes spicy hints, and sometimes earthy flavors like the smell and taste of mushrooms. Pinot Noir should be served at close to cellar temperature (58-60 degrees), not at room temperature.